The following table outlines our standard selection of octave bandwidth coaxial isolators. Our capabilites, however, extend well beyond the standard models listed. MDI is always ready and willing to work with you on your unique requirements for isolators. Contact us with your specifications. Note: Customer must specify reverse power in order to determine the required power rating of the termination. Standard connectors are SMA female. Type N, 2.92mm, 3.5mm and 7/16 DIN connectors are also available. To order SMA Female connectors on any unit, replace the 'X' in the model number with 'S'. To order Type N Female connectors on any unit, replace the 'X' in the model number with' N'. 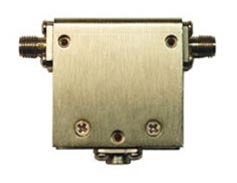 To order 2.92mm Female connectors on any unit, replace the 'X' in the model number with '2'. To order 3.5mm Female connectors on any unit, replace the 'X' in the model number with '3'. To order 7/16 DIN Female connectors on any unit, replace the 'X' in the model number with 'D7'. To inquire about other connector options or performance specifications, please consult the factory.